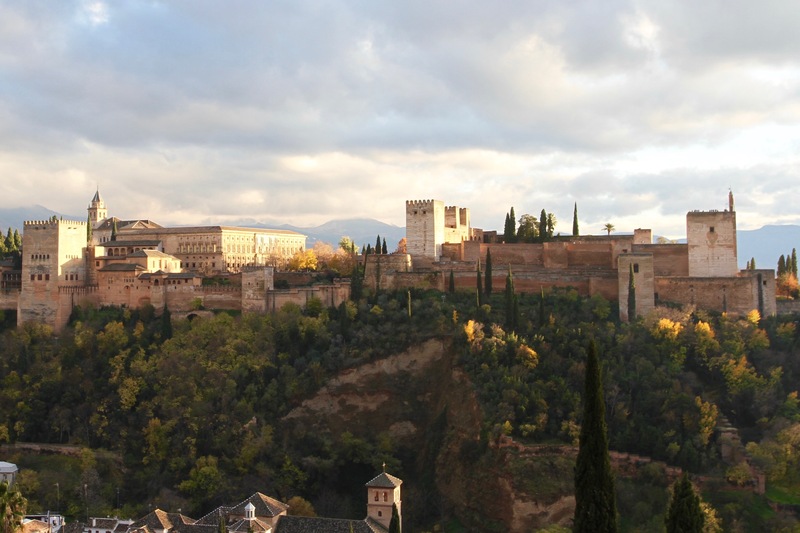 The Sierra Nevada rises majestically behind Granada. It’s fantastically beautiful, and so close to the fleshpots of the Costa del Sol you can see the blue of the Mediterranean from here. The name means “Snowy Range”, and it’s one of Spain’s most attractive national parks. There are twenty mountains over 3,000m, and hundreds of kilometres of hiking trails. More than it’s glorious snow-capped peaks though, this is an area with a fascinating history. 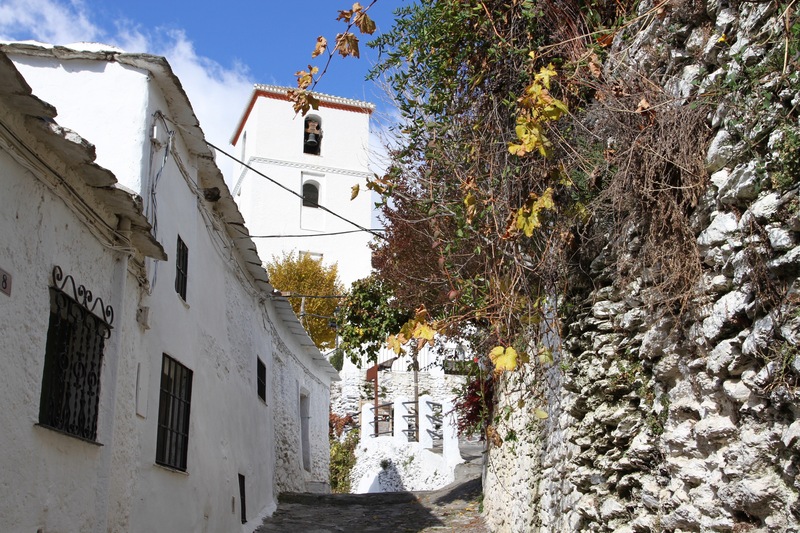 Visit the picturesque pueblos blancos that are scattered dramatically around the mountains and valleys of the Alpujarras region, and you can’t help but notice ancient irrigation systems that arrived in the region with the Moors in 711AD. 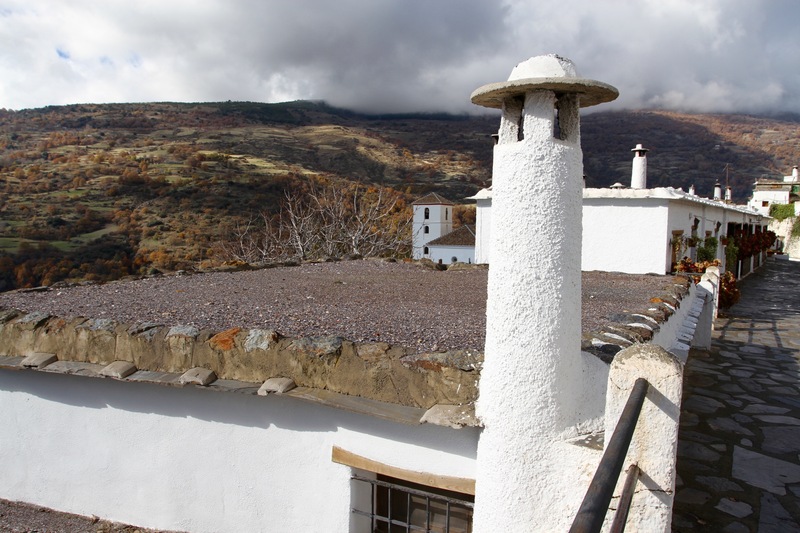 The village houses have distinctive flat roofs and mushroom-like chimneys, imported from north Africa by Berbers who were part of the invading Arab forces. 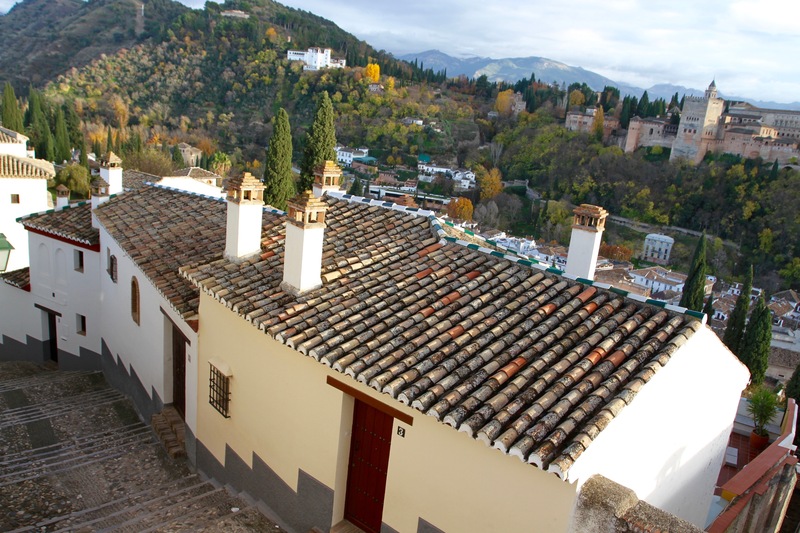 This whole region, as remote as it was possible to get in 15th century Spain, was the final refuge of Spain’s Moors after the capitulation of the Emirate of Granada in 1492. 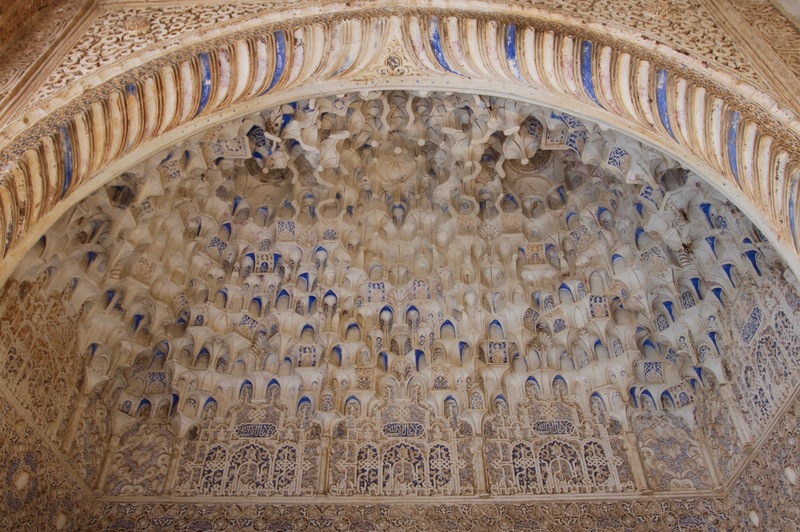 The rugged mountains and deep valleys sheltered the remaining Muslim population and, for several decades, the communities that lived here maintained a unique Islamic culture that had thrived for nearly 800 years. 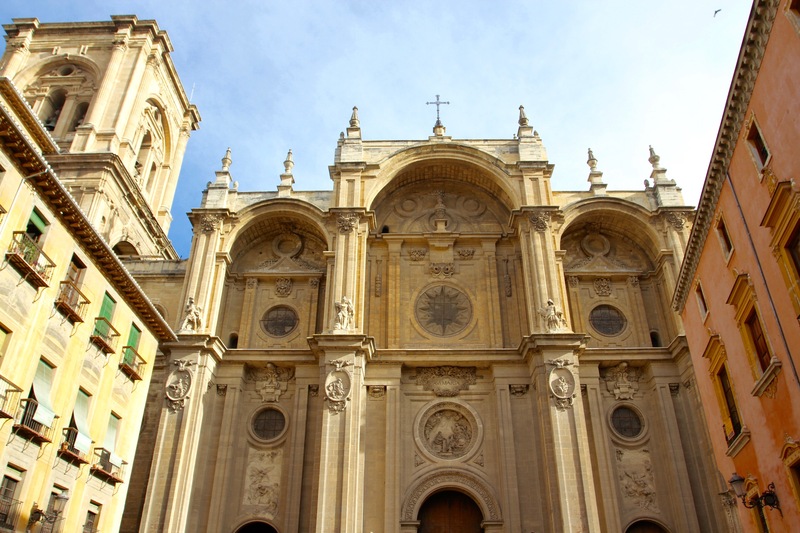 They also maintained a fierce independence from the rest of Spain, and resisted forced conversion to Christianity. 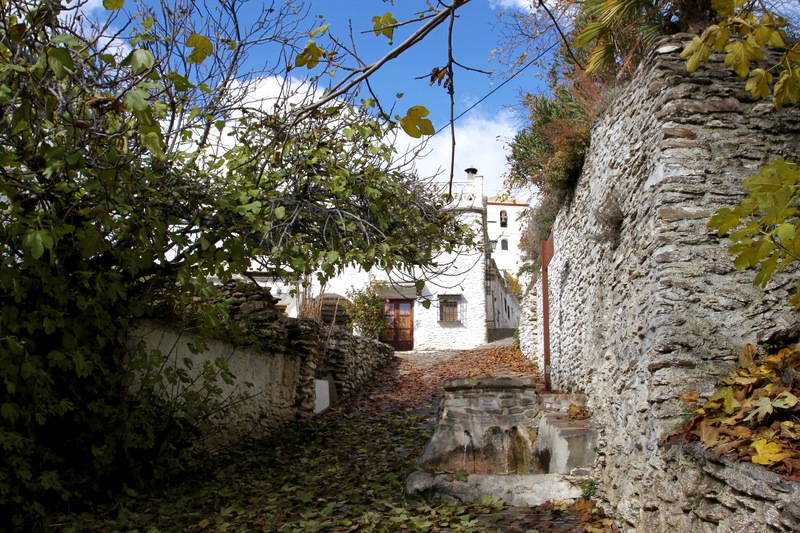 On several occasions the people rebelled against Spanish rule and oppression, waging guerrilla warfare from their secure mountain hideout. 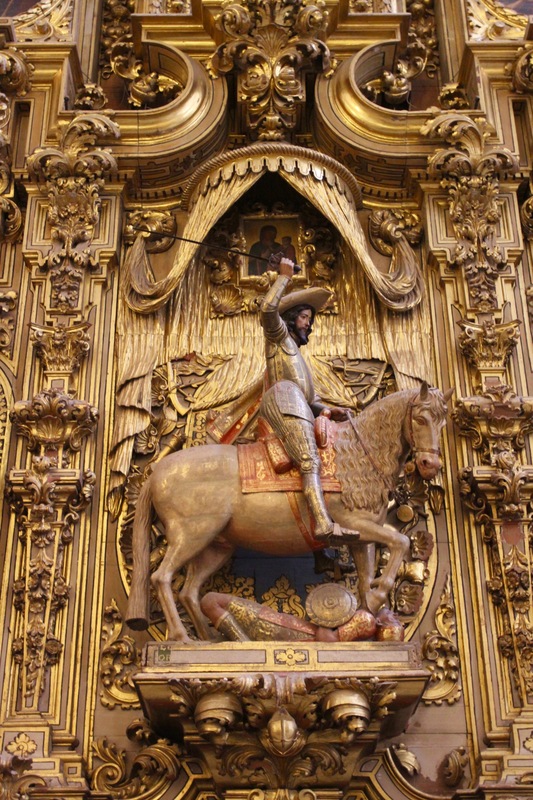 The region was only pacified after the Morisco Rebellion of 1568 was ruthlessly crushed after three years of fighting. 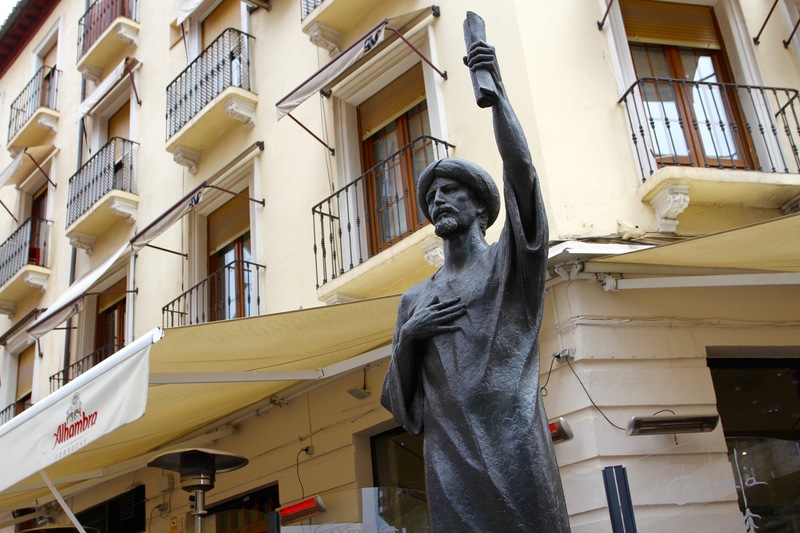 The rebellion’s leader, Ben Humeya, was publicly executed in the square in Granada, and a royal decree was issued expelling anyone of Arab descent from the region. Taking no chances, the Spanish authorities then imported thousands of Christian settlers from as far away as Galicia and Asturias. 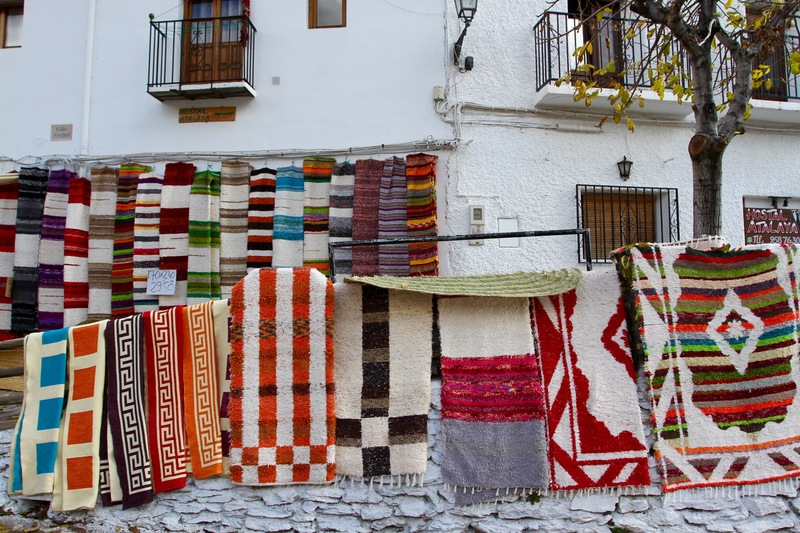 Regions as remote and different from Andalusia as you can get in Spain. Presumably the hope was that the new settlers would wipe out all traces of Islamic culture. 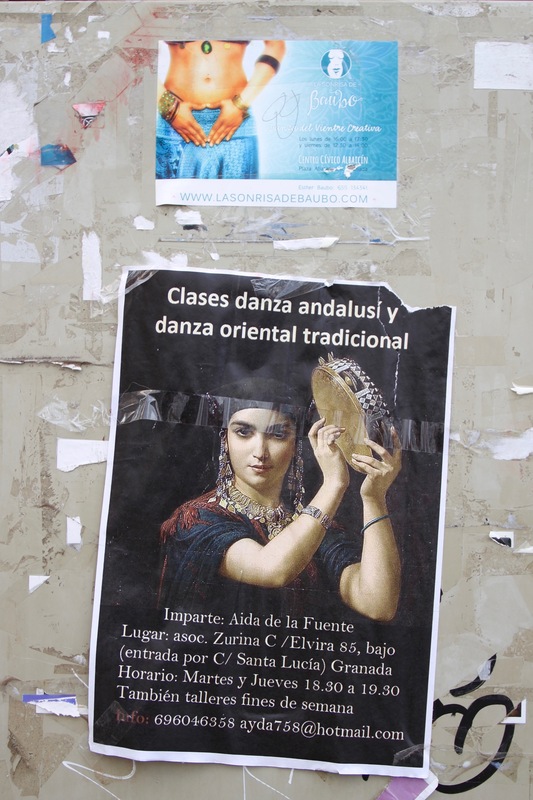 I’m not sure they succeeded, the region feels different from other bits of Spain I’ve visited – although tourism may well succeed where religious fundamentalism failed. 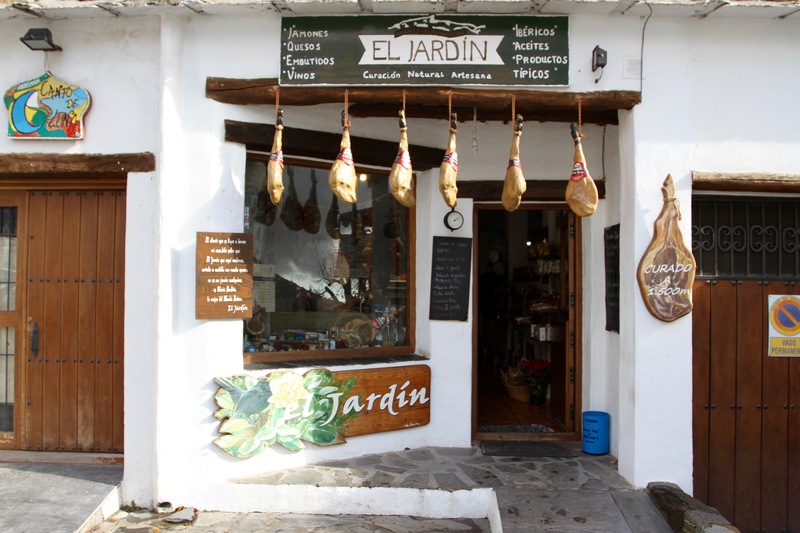 We’d been told that the most ‘authentic’ area of Las Alpujarras was to be found in the Poqueira Valley, a narrow gorge that is accessed by a steep and winding road. Strung out high up the valley are three extraordinarily attractive and picturesque villages, the luminous white houses improbably clinging to the mountainside. The drive to the first village was an adventure in itself. The road to Pampaneira has numerous switchbacks and is very steep in places, but the nausea-inducing journey is worth it when you finally arrive. 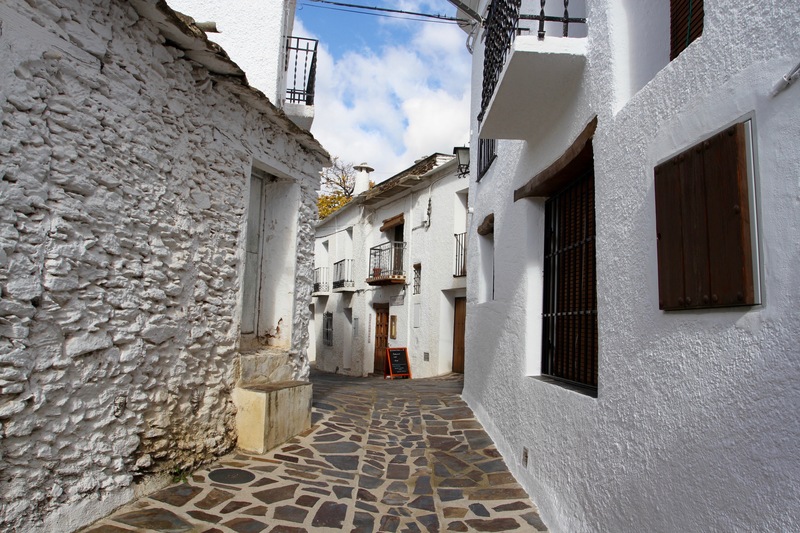 Pampaneira was the busiest of the three villages, a fact underscored by the arrival of a tour bus as we sat drinking a coffee and eating pan con tomate in the fresh mountain air. 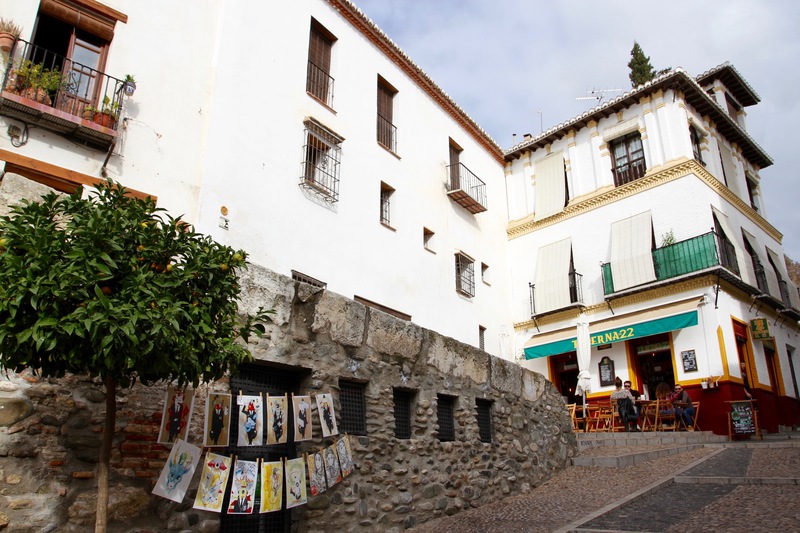 There are cafes, restaurants, arts and crafts shops, and a very pleasant little church in the main square. 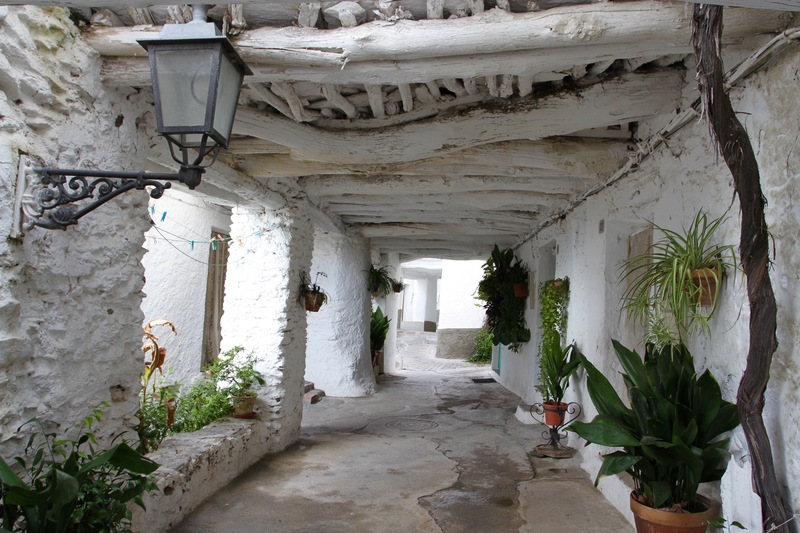 If that was all you saw of the village, you wouldn’t be disappointed, but a walk through the narrow, steep streets gives you a real sense of the place. 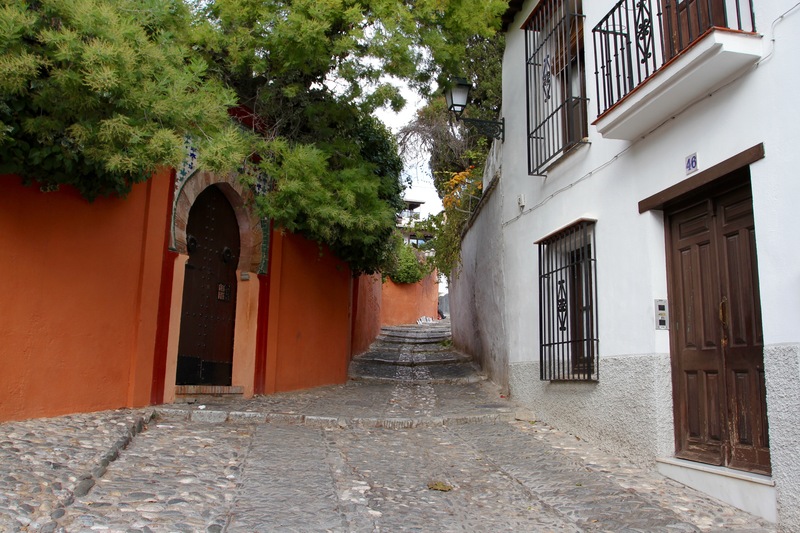 Bubión, a little further up the mountain road, is smaller but equally picturesque. The top of the square church tower stands out against the mountain behind, and a walk through the village to reach the church square was fabulously atmospheric. Be warned though, the streets are steep and whenever you go down, you have to come back up again. Although it was a hot sunny day, the tops of the mountains were covered in cloud, obscuring the fresh snow that had fallen. 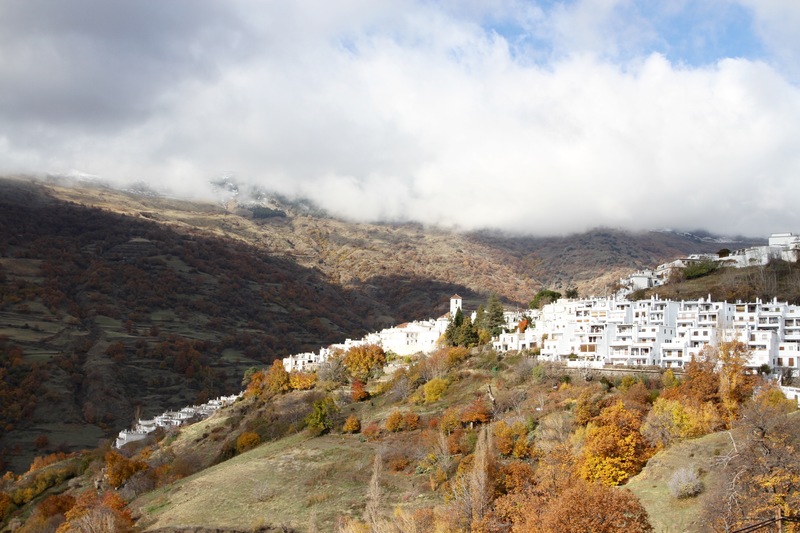 When we reached Capileira at the top of the valley, the cloud was descending and the sun disappeared. The temperature noticeably dropped the moment the sun went behind the cloud, but it didn’t spoil the magnificent views down the full length of the valley. 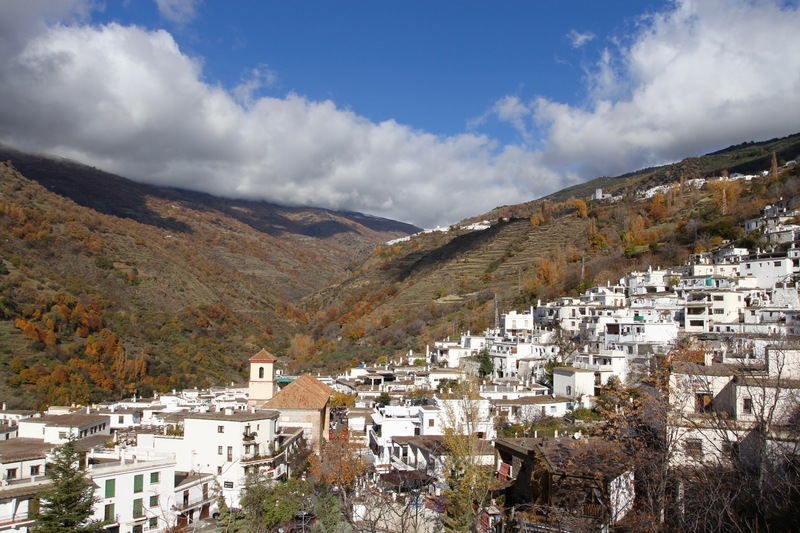 At 1,436m in altitude, Capileira is considered to be one of the most traditional villages in the Alpujarra. It certainly felt a million miles away from the hustle and bustle of the modern world. We sat and had a drink while drinking in the spectacular views, and made plans to return when the weather was a little warmer, and the trails into the mountains fully open. The year 1492 is the stuff of legend in Western Europe. Even if history is a continuum, it was a year that marked a dramatic change in the course of world history. 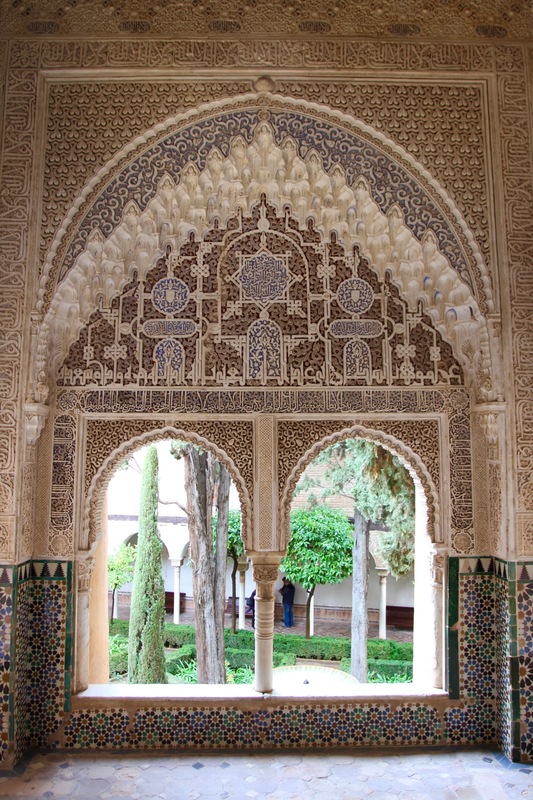 The Spanish Reconquista led by the Catholic monarchs, Ferdinand and Isabella, finally defeated the Emirate of Granada, the last Islamic kingdom in what had once been a vast Moorish empire covering most of Spain and Portugal. 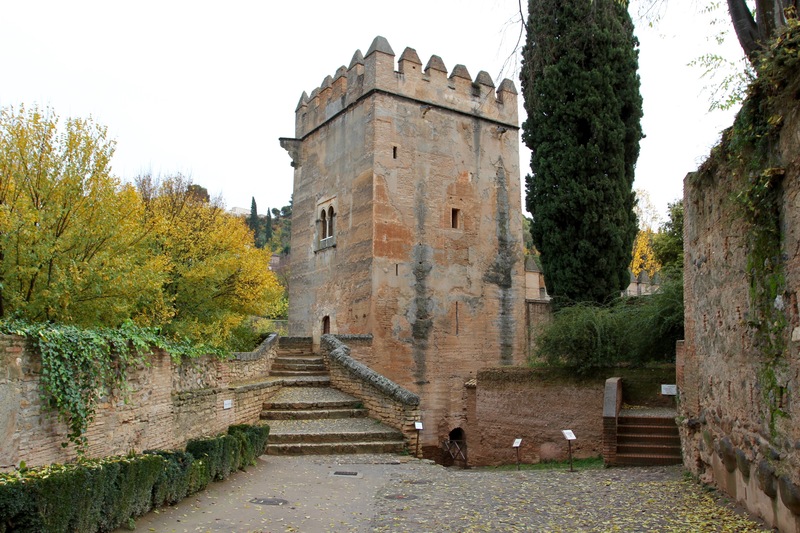 It took eight months of siege warfare to force the surrender of Granada, and with it the collapse of Moorish rule. 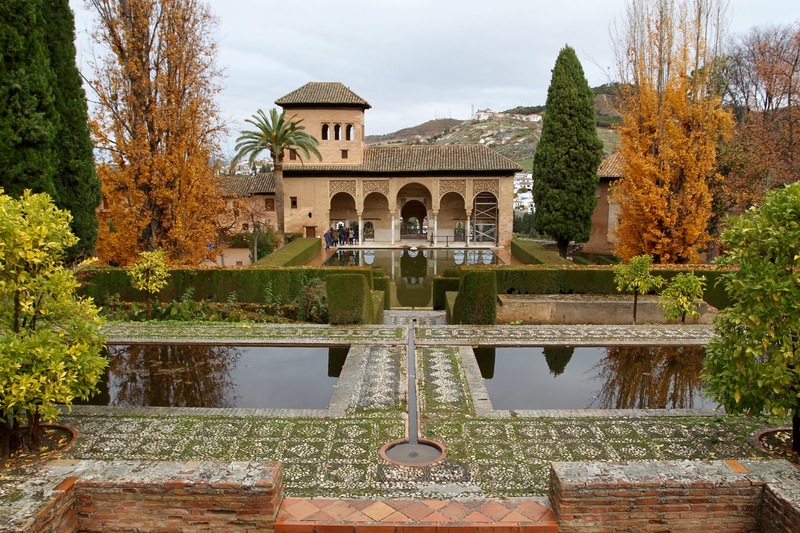 It was January 1492 and, after centuries of conflict, the fall of Al Andalus must have seemed like a pretty good start to the year for Ferdinand and Isabella. 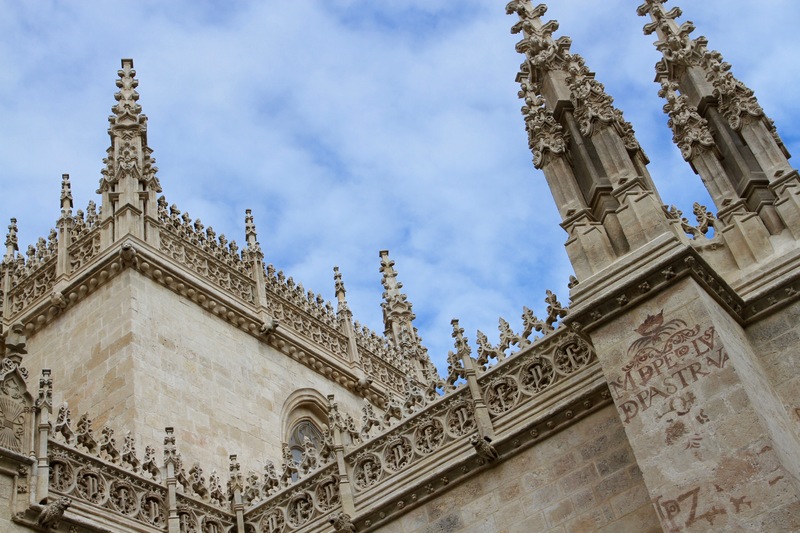 Liberated from reuniting the Iberian Peninsula under their rule, they turned their attentions to other things. Fatefully for the peoples of the Americas, they decided to finance the first voyage of Christopher Columbus. 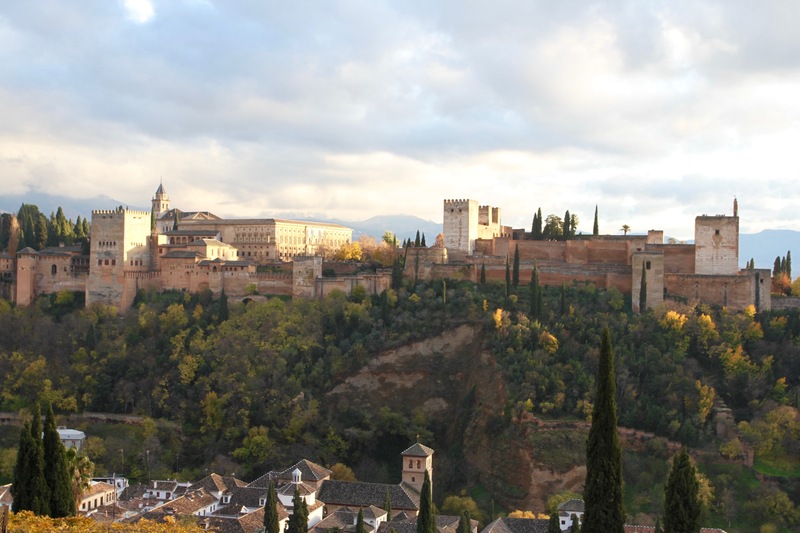 The Italian explorer had been pleading with the two monarchs to support his plans for several years, the fall of Granada made that investment seem worthwhile. In August 1492 Columbus sailed west across the Atlantic. As the Moorish empire in Europe ended, Europe took its first steps to colonise the Americas. 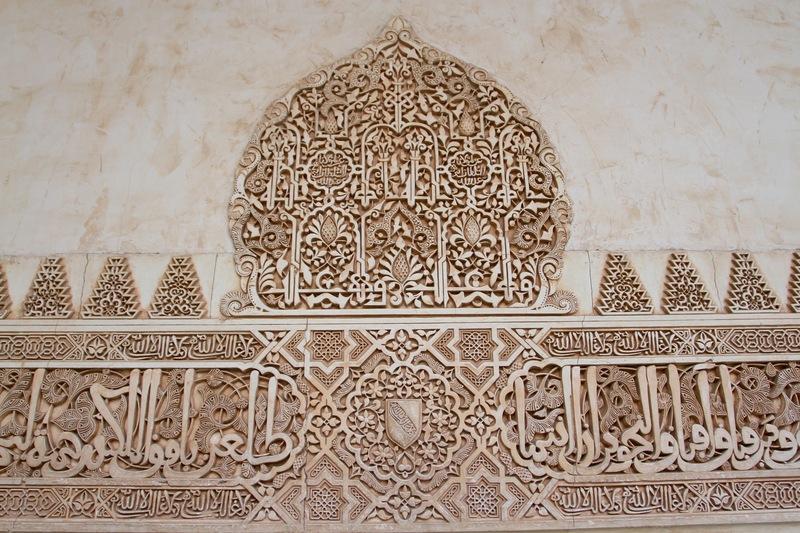 The fall of the Emirate of Granada brought to an end nearly eight centuries of Moorish culture across the Iberian Peninsula. Despite the constant warfare, this was a period of extraordinary political, economic and artistic flourishing. 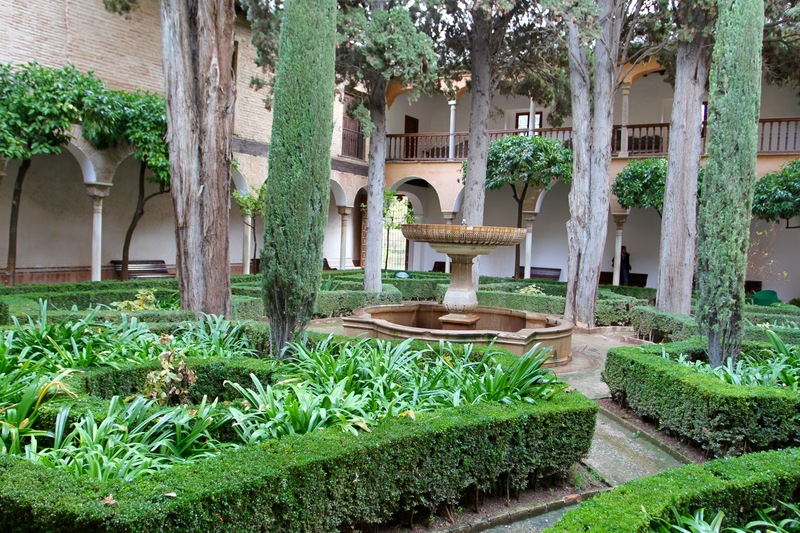 It has bequeathed Spain a vast cultural legacy that can be summed up in three words: Cordoba, Granada, Seville. 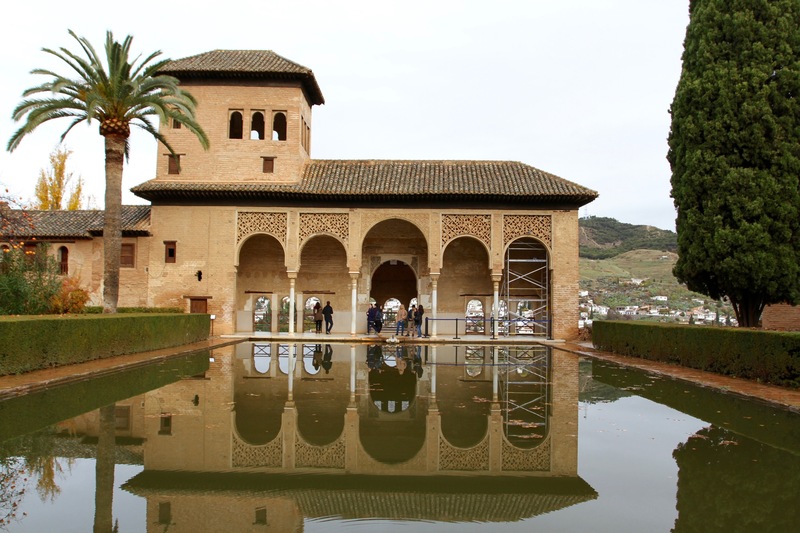 All three cities preserve magnificent examples of Islamic rule – Cordoba’s Mezquita, Seville’s Alcázar and Granada’s Alhambra – but it’s in the narrow medina-like streets of the historic heart of these cities that Spain’s Islamic past truly comes alive. 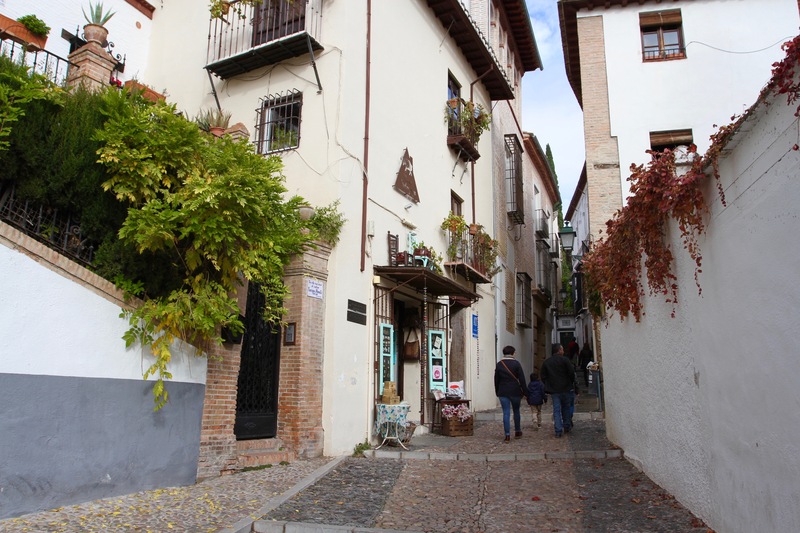 I’ve visited all three, and for pure atmosphere the cobbled streets, winding alleyways and narrow lanes of Granada’s Albaicín district are hard to beat. 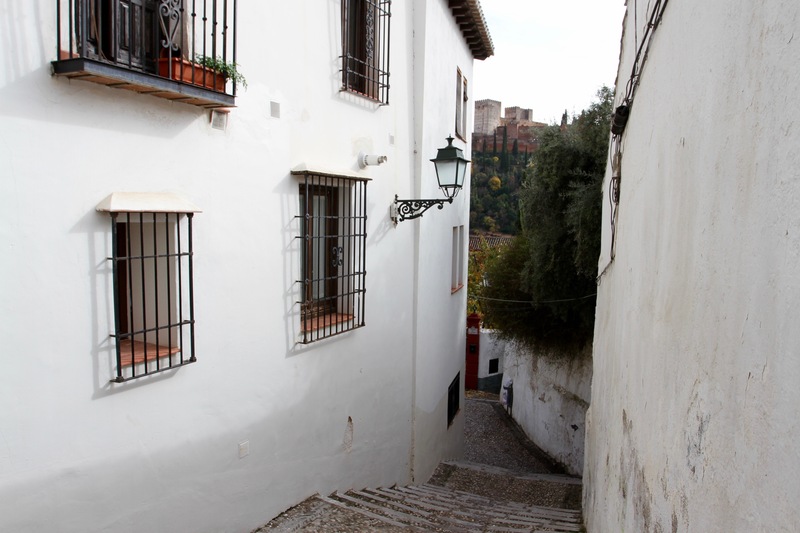 This is a touristy part of town, but it didn’t seem too difficult to find ourselves walking alone on the cobbles, discovering pleasant squares, grabbing picturesque views of the Alhambra, and discovering lovely tapas bars. At night the tranquil, silent streets oozed atmosphere. 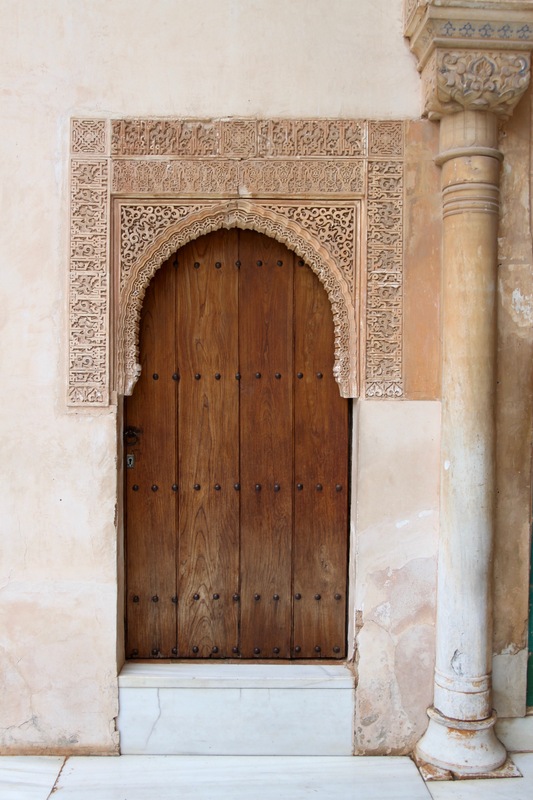 It just needed the sound of the call to prayer from a minaret and we’d have been transported back to the 14th century. 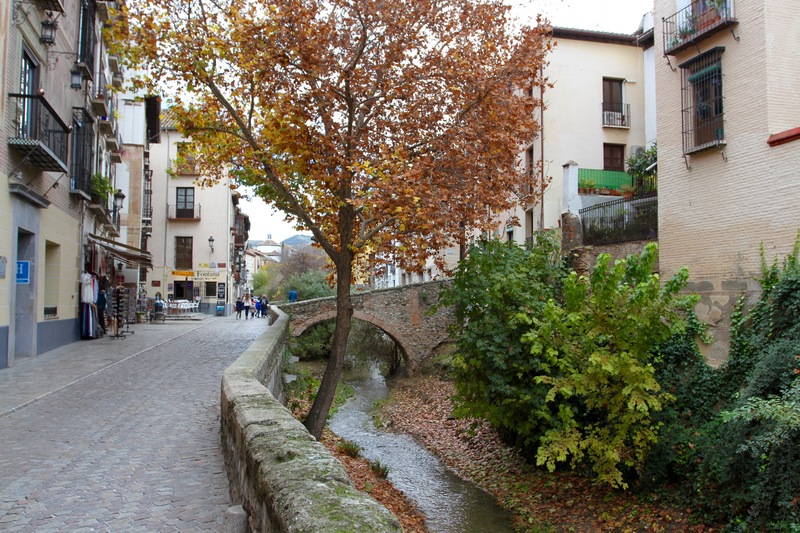 South of the Albaicín is El Realejo. 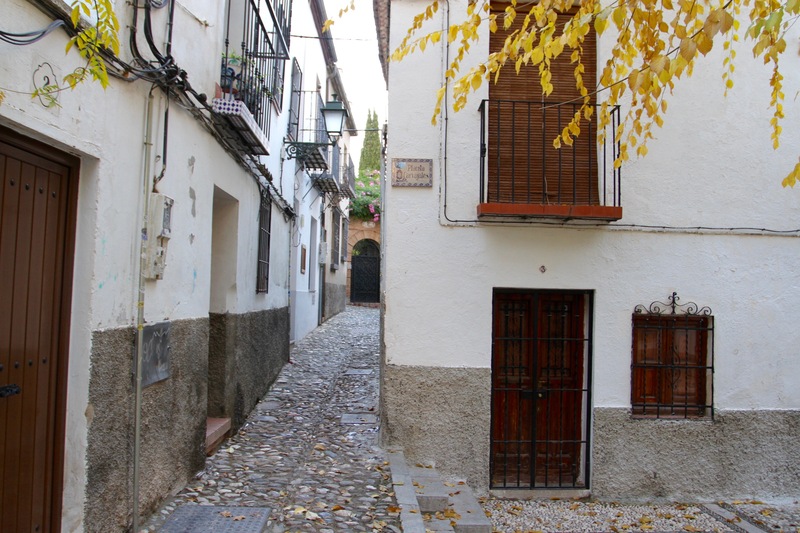 Before all Spanish Jews were forcibly converted to Christianity or thrown out of the country, this was the historic old Jewish quarter. 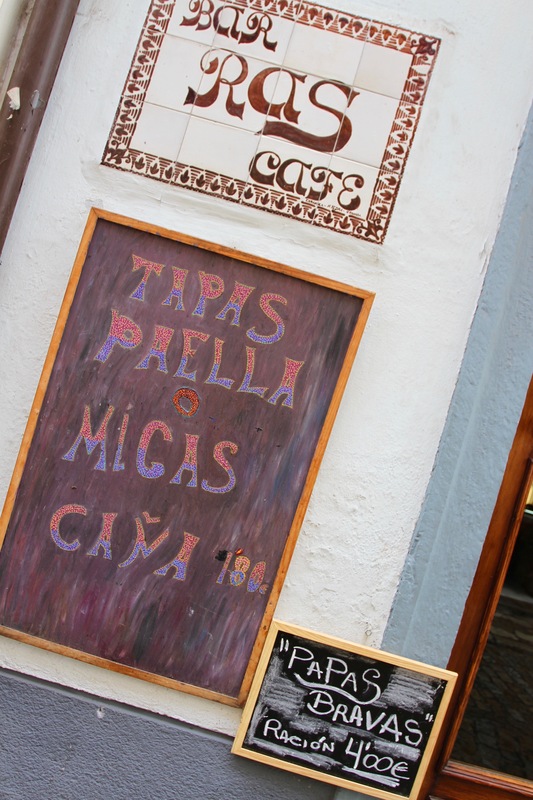 It’s a vibrant place with good tapas bars and bustling squares. 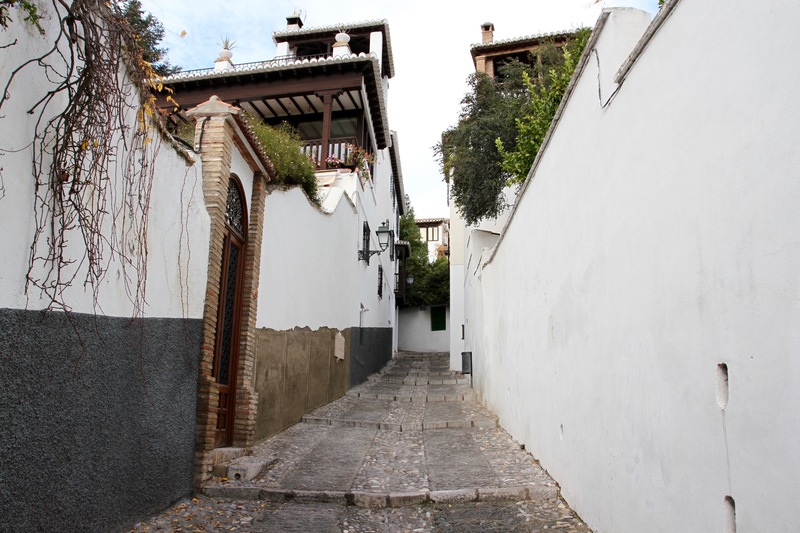 We wandered through it on our way to explore the area around Granada’s enormous and imposing cathedral, another barrio worth spending some time in. 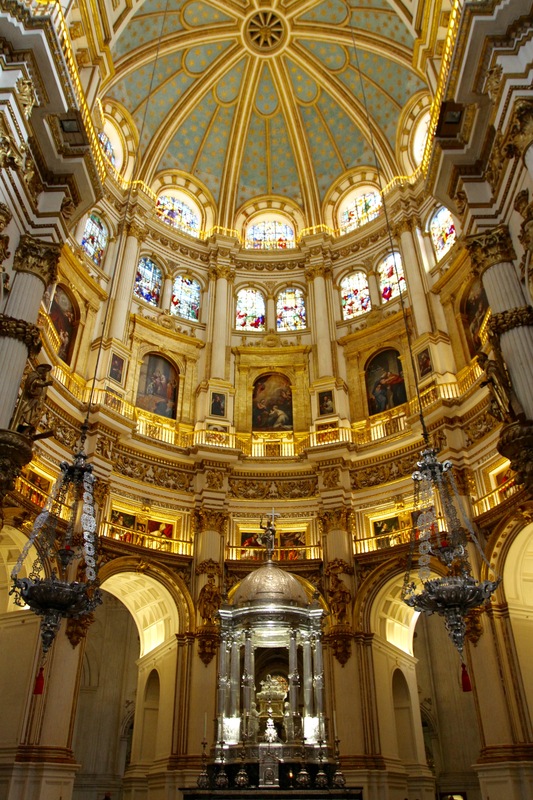 Granada’s cathedral was designed to make a statement. 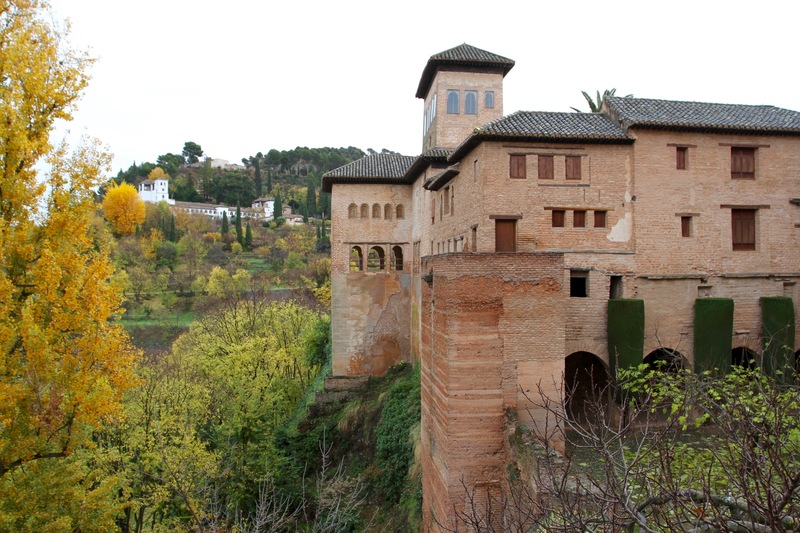 Commissioned by the same King Charles who added the Renaissance monstrosities to the Alhambra, it was never likely to be a subtle, simple building. 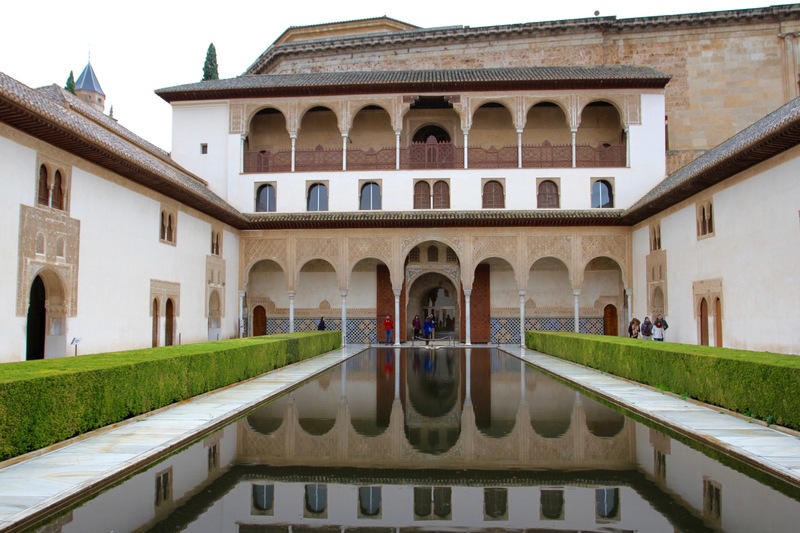 It was constructed on the ruins of Granada’s Great Mosque, and was meant to send a message: Spain, with its newly conquered empire in the Americas, was the greatest of European powers. 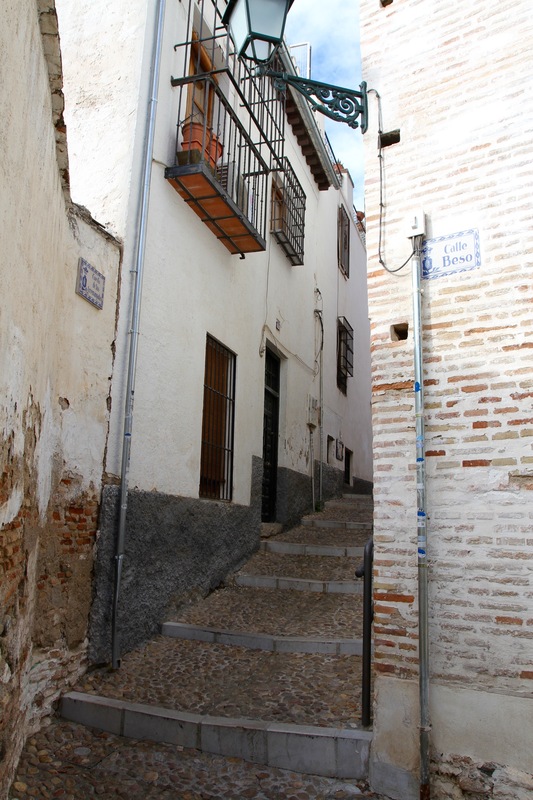 The cathedral towers upwards but is hemmed in by narrow streets and houses. It’s hard to get a real sense of the whole building, and even the square outside the grand entrance does little to remove the feeling of claustrophobia. 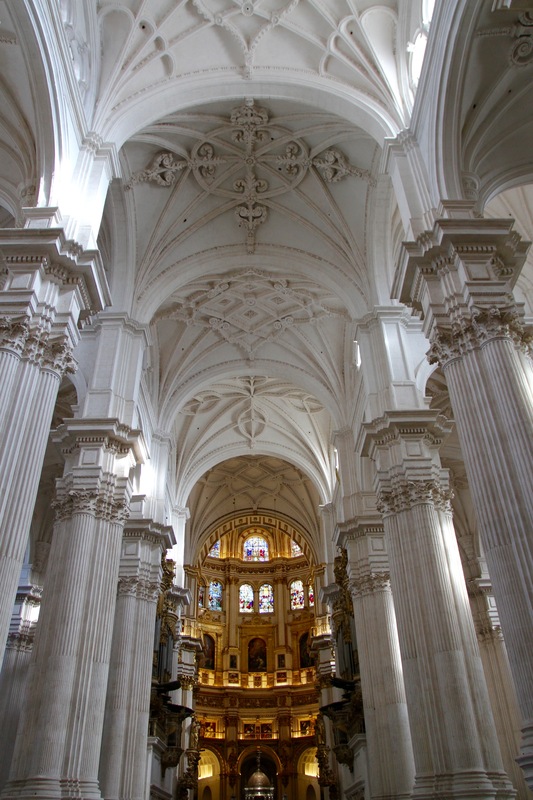 Maybe that’s the point, because, once inside, the vast interior space and white stone columns transcend the ordinary exterior. 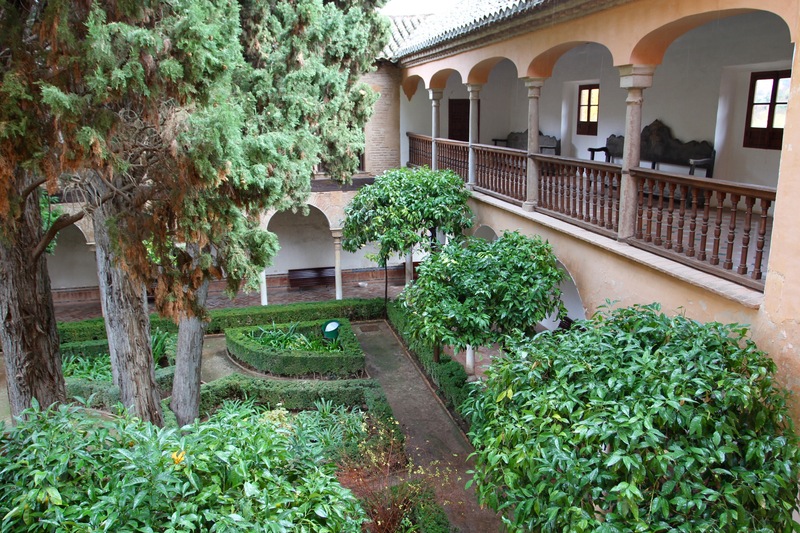 As with Cordoba’s Mezquita, which had a church built in the middle of it, it’s hard not to judge the two architectural styles that have been handed down to contemporary Granada. 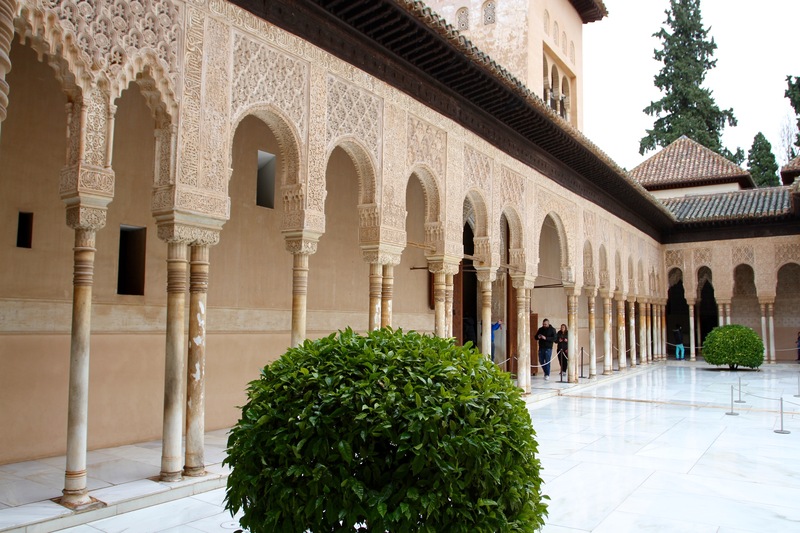 While the Arabic Alhambra feels light and uplifting, Granada cathedral feels heavy and oppressive. 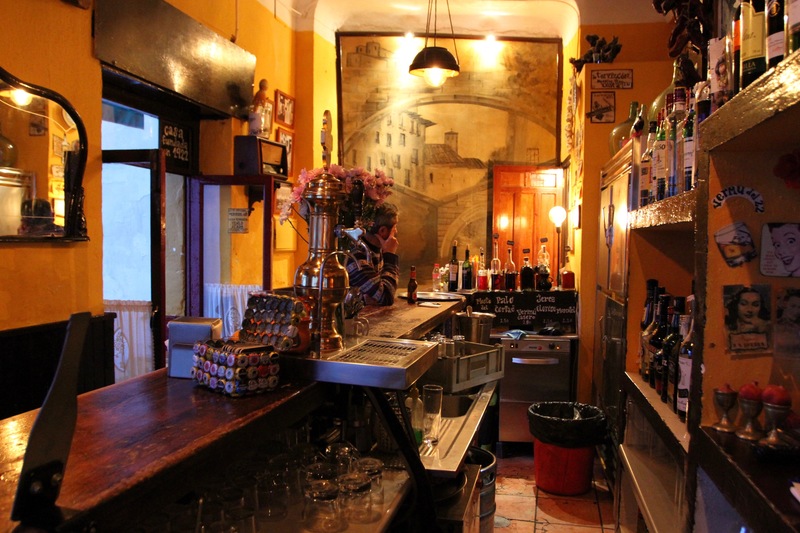 As if to compensate, the area around here has a lot of lively bars and restaurants filled with happy crowds. 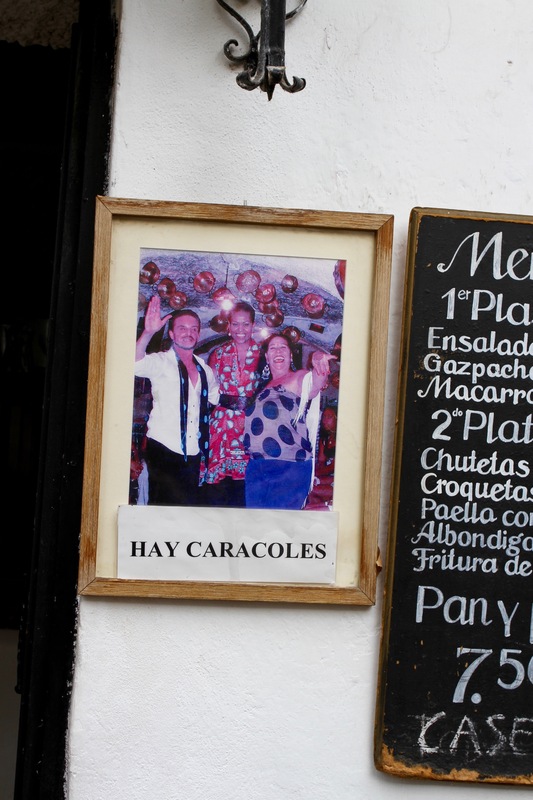 We spent our final night in the streets around the cathedral, carousing with the local crowds and trying the tapas specialities of each bar. 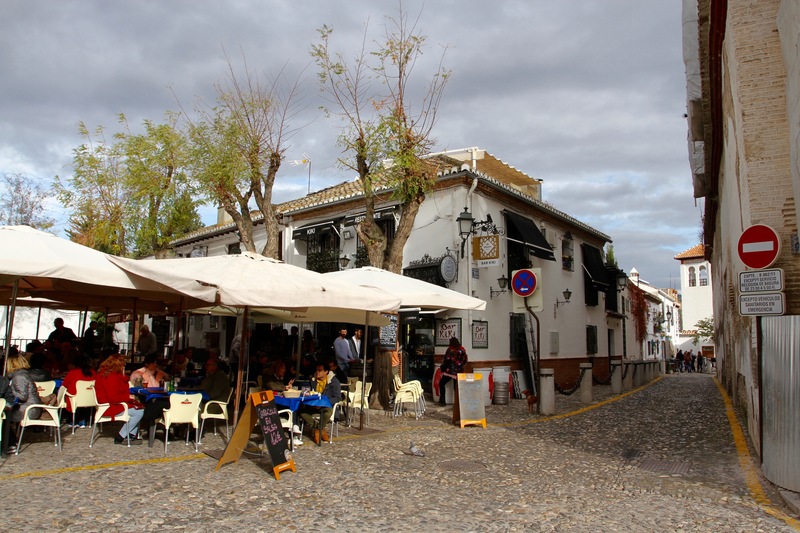 The next day we would leave Granada to explore the Sierra Nevada’s pueblo blancos, where nightlife would be hard to find. 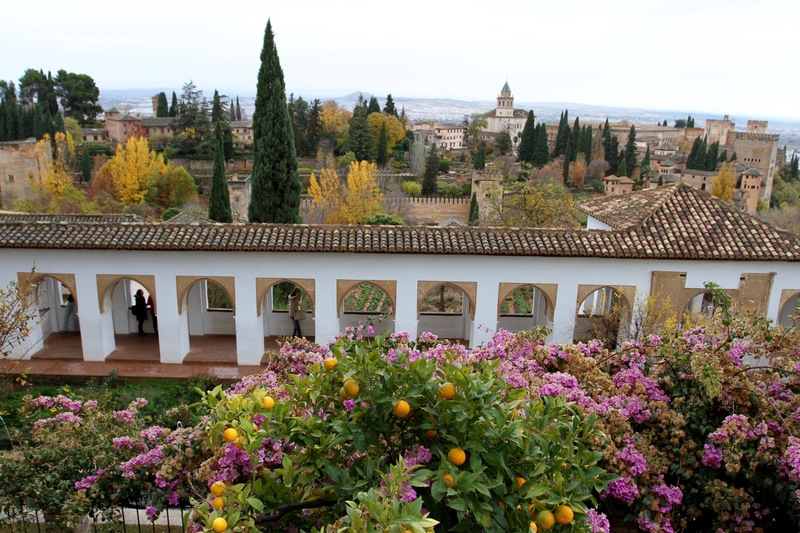 I work with a number of Spanish people, each and every one of whom had the same response when I said I was making my first visit to Granada. First, came an expression of surprise, why hadn’t I visited before? 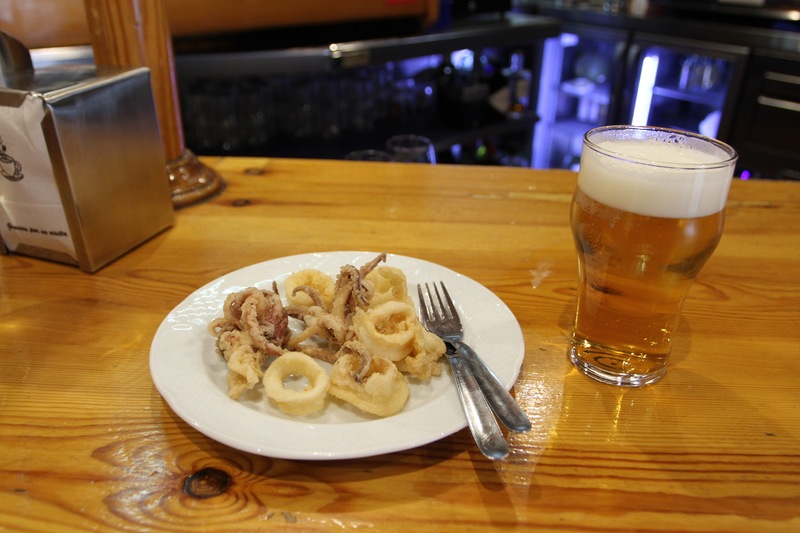 This was quickly passed over though, as they extolled the virtues of a city renowned not only for good food, but for serving up the largest, most varied portions of free tapas anywhere in Spain. 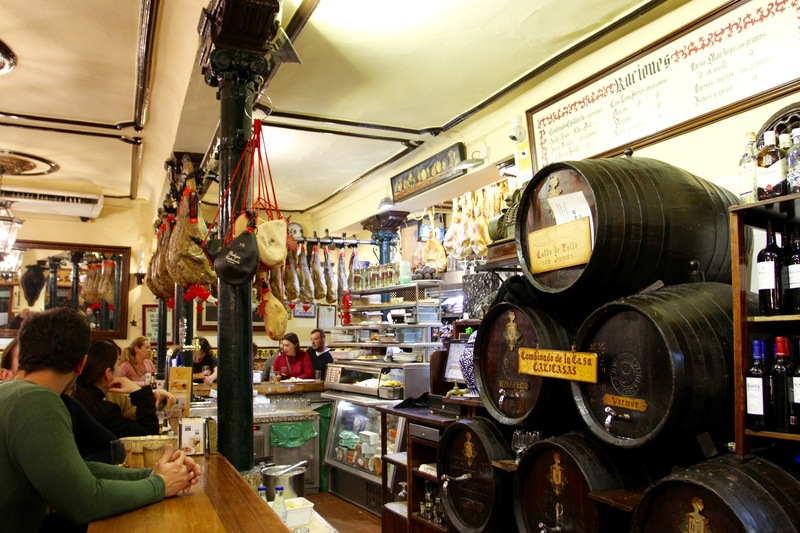 I’m not saying Dutch food culture isn’t good (let’s just say this isn’t France or Italy), but for Spanish people living in the Netherlands, memories of really good food seem to be disproportionately important. 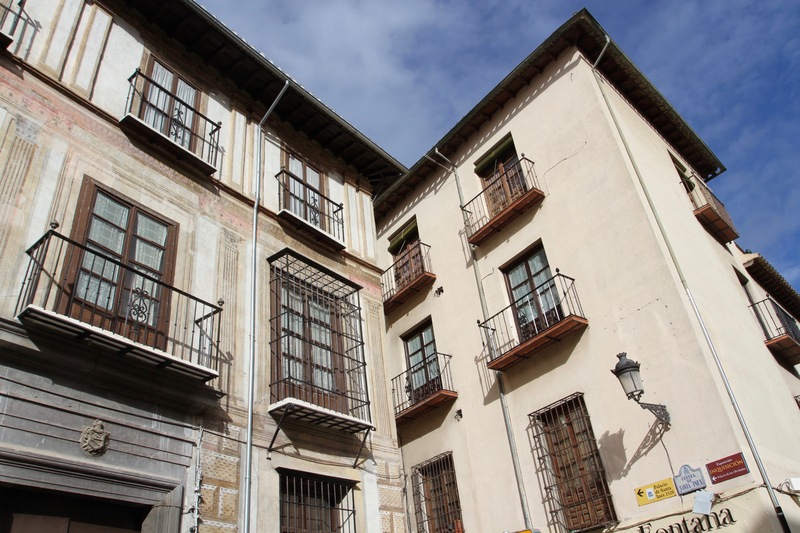 One colleague was moved to raptures remembering a traditional fish dish that she’d eaten in some small cafe in one of Granada’s winding medieval streets. 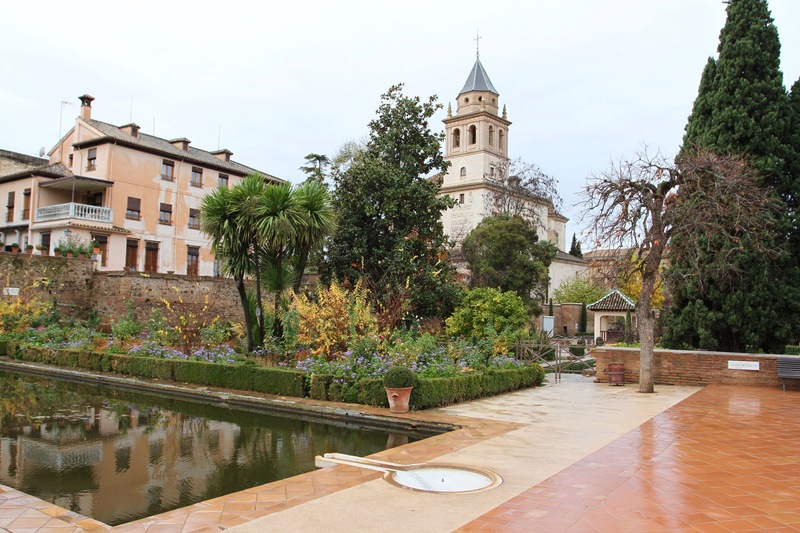 The subject of Granada’s food seemed far more interesting than, say, the fact that it is home to one of the world’s most famous buildings, and UNESCO World Heritage Site, the Alhambra. It was looking like I wouldn’t need to worry about what to eat, only when to stop. 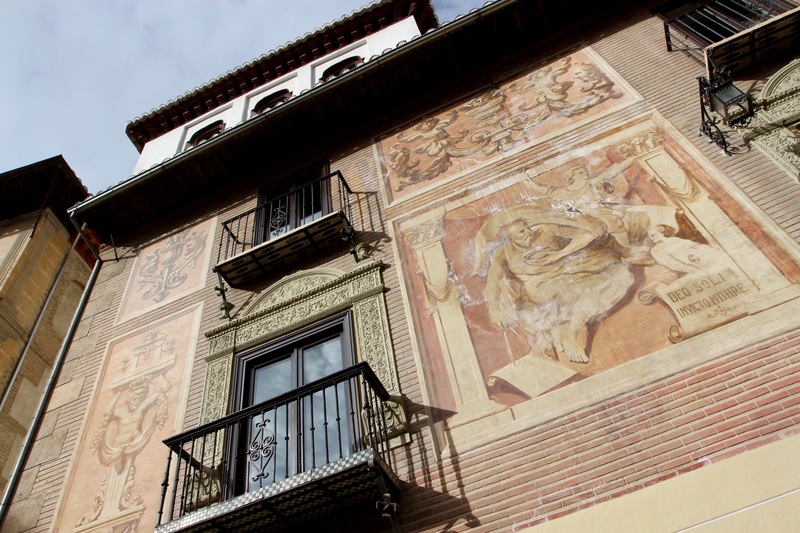 Granada is deservedly one of the most famous places in Europe. 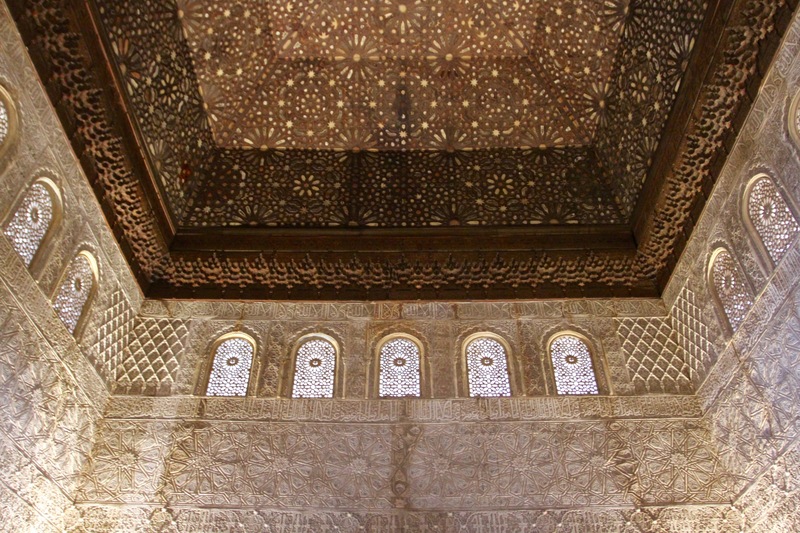 It’s main attraction, the Alhambra, is a spectacular example of Islamic architecture from the very height of Moorish power and cultural influence in Spain. 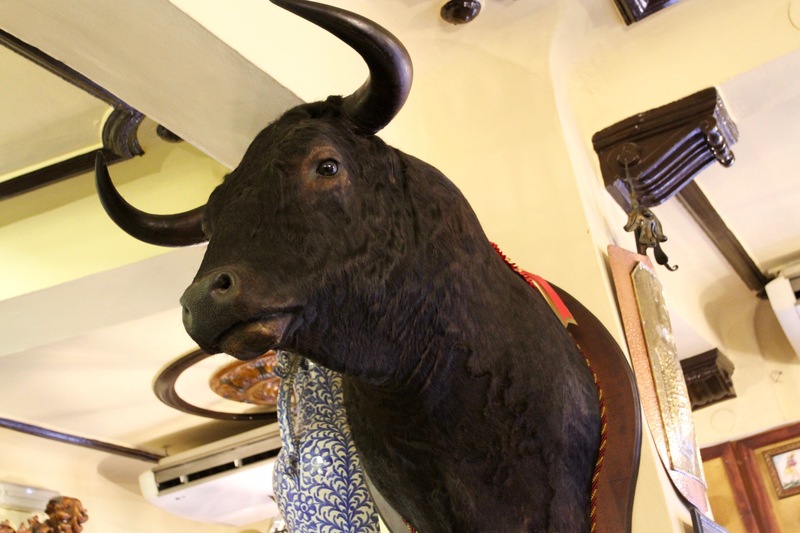 Such is its popularity, it attracts around 8,500 visitors each day, or around 2.5 million people each year. That’s ten times the population of the town. In many ways though, the town itself is the star attraction. 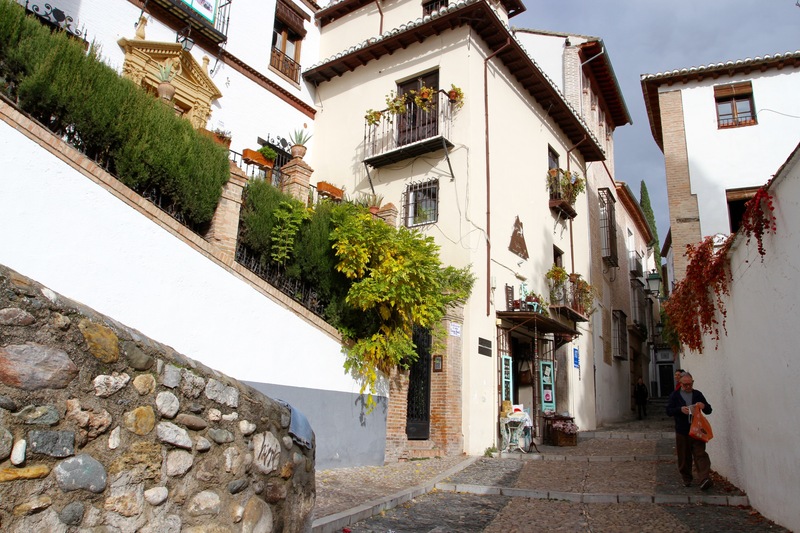 You could spend days wandering the narrow lanes and alleyways, walking up and down the hills of the central Albaicín district, only to have scratched the surface of this mesmerising place. History seems to seep out of every wall, and every turn of a corner brings you face to face with yet more of the town’s fabled past. 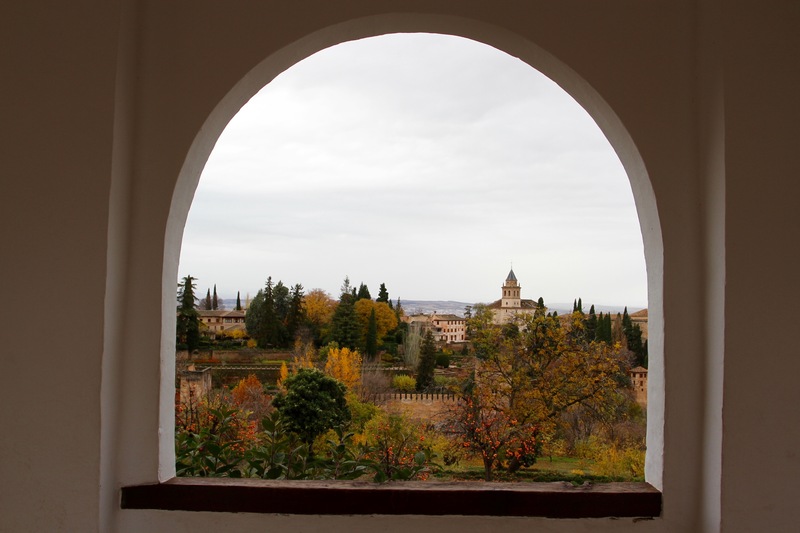 Given that, our first sight of Granada was a bit underwhelming. 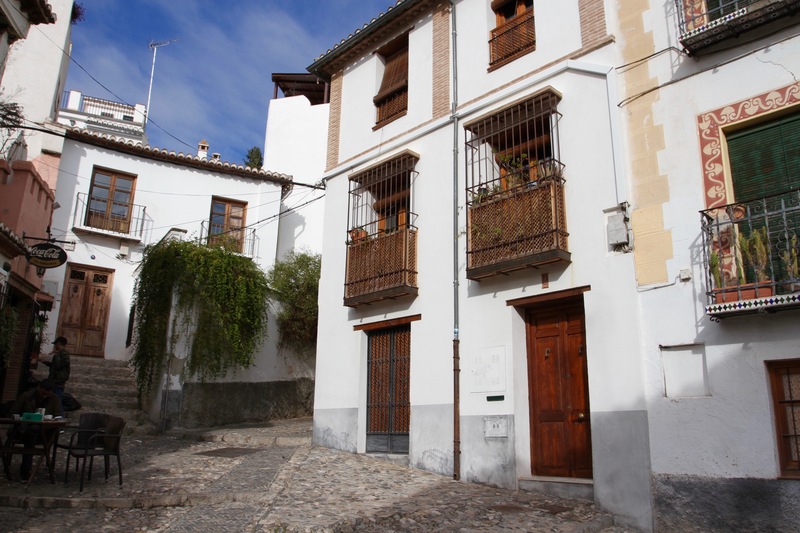 The outskirts of towns are normally disappointing, but Spanish towns seem to excel at ‘dismal’. It didn’t help that we were stuck in a traffic jam. 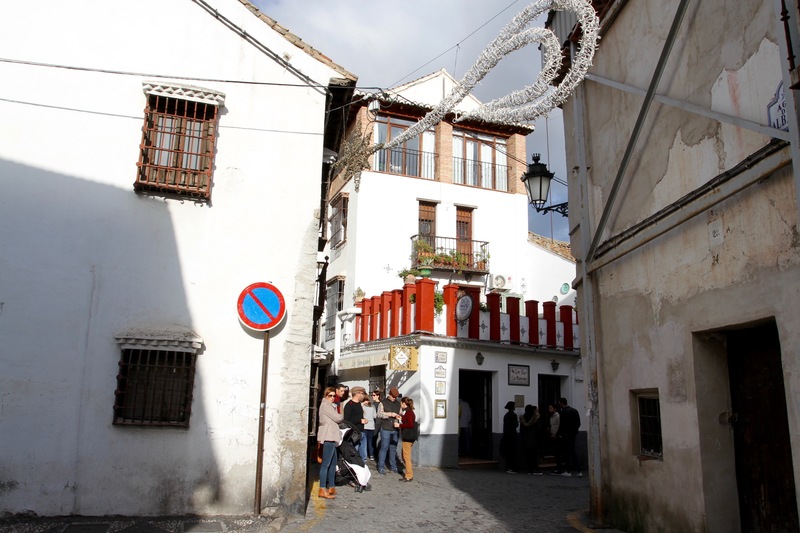 When we finally arrived in the historic centre, we instantly lost our way amidst narrow streets. I got a €120 fine as a consequence. We may have been in a beautiful medieval town, but we were going nowhere fast. 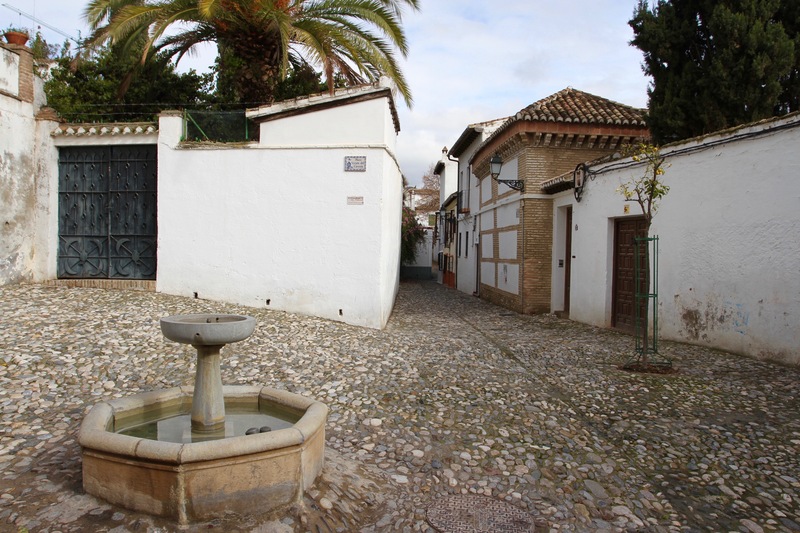 We eventually found a carpark, and were soon walking along beautiful cobbled streets towards the El Ladron de Agua Hotel. 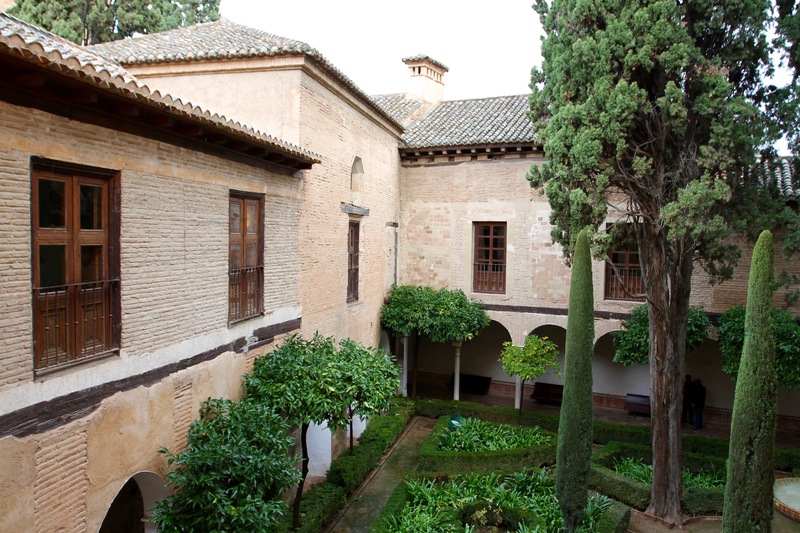 The hotel sits underneath the walls of the Alhambra on the Carrera del Darro, and occupies a 16th-century palace that was once home to nobility. A welcoming glass of chilled fino compensated for the trauma of driving in Granada and, refreshed, it was time for lunch. Would the food live up to its billing? 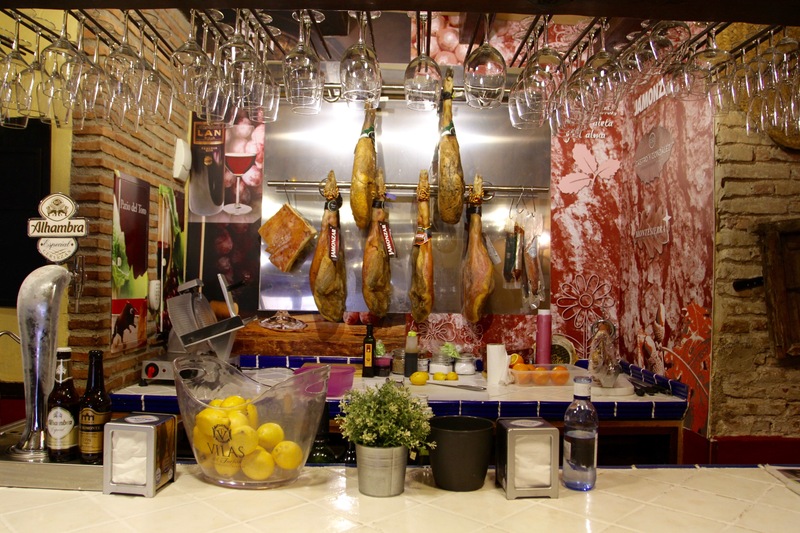 Order a glass of tinto or an oloroso in any of Granada’s many atmospheric bars, and it will be accompanied by a sizeable plate of the tapas of the day. 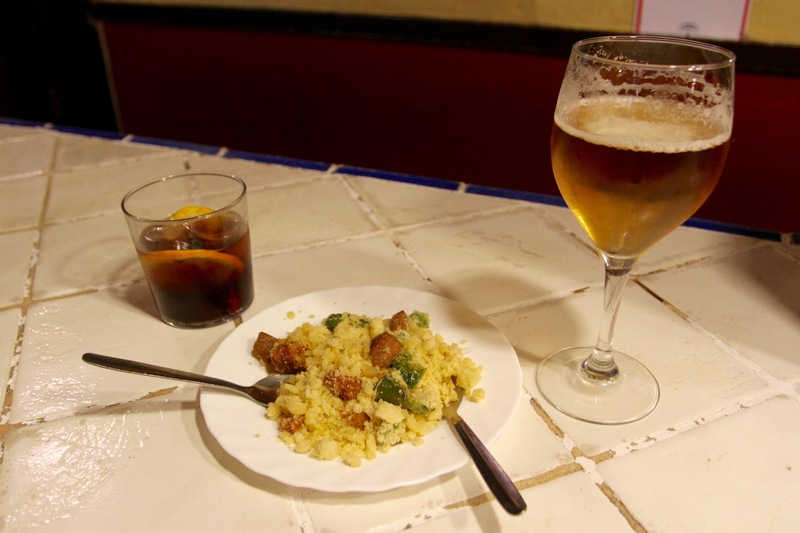 Order a second drink and a different, but equally sizeable, portion of tapas arrives in front of you … and the food is good. Most places advertise their specials of the day, just buy a drink and tuck in. 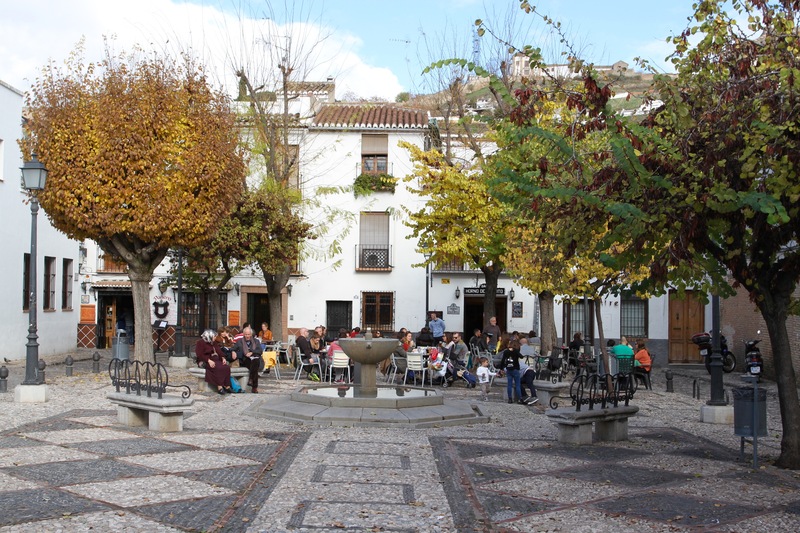 Granada’s an economical place to spend time. We spent four days here, only ate lunch once and never felt the need for dinner. This may say more about how much sherry we drank than the availability of restaurants offering dinner. 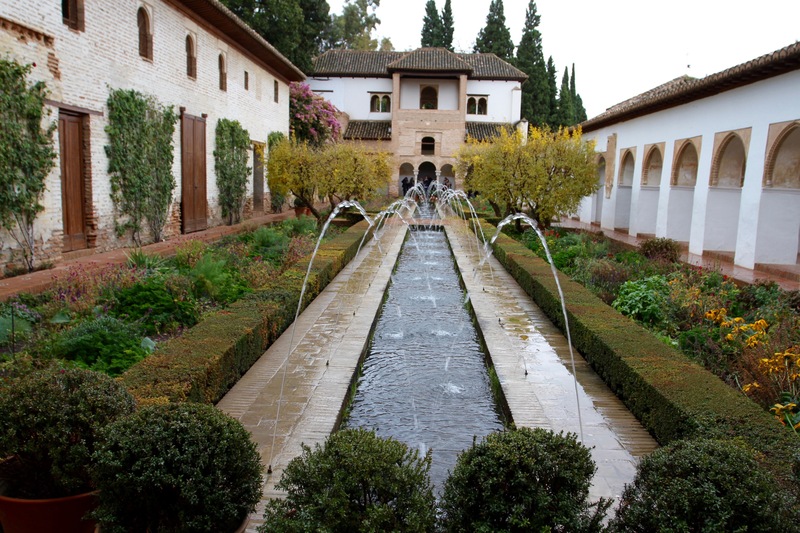 Beyond a day at the Alhambra, we didn’t have a plan. 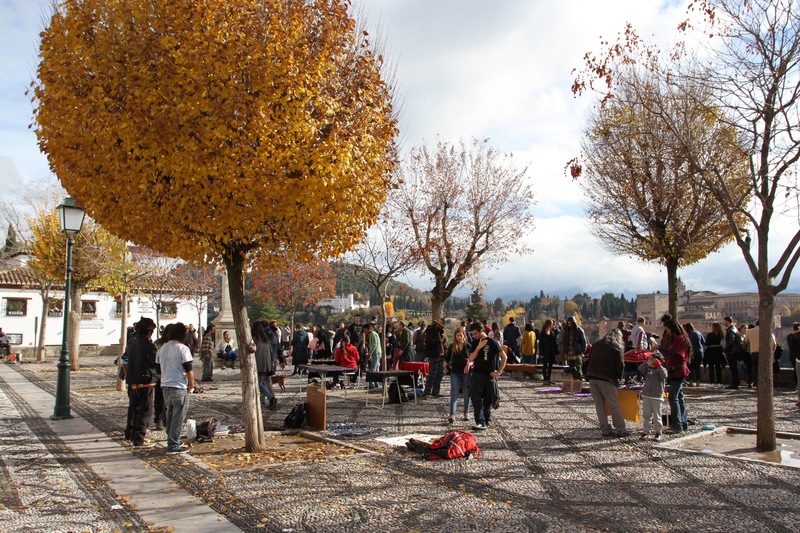 This, though, is a town that rewards aimless, leisurely exploration. 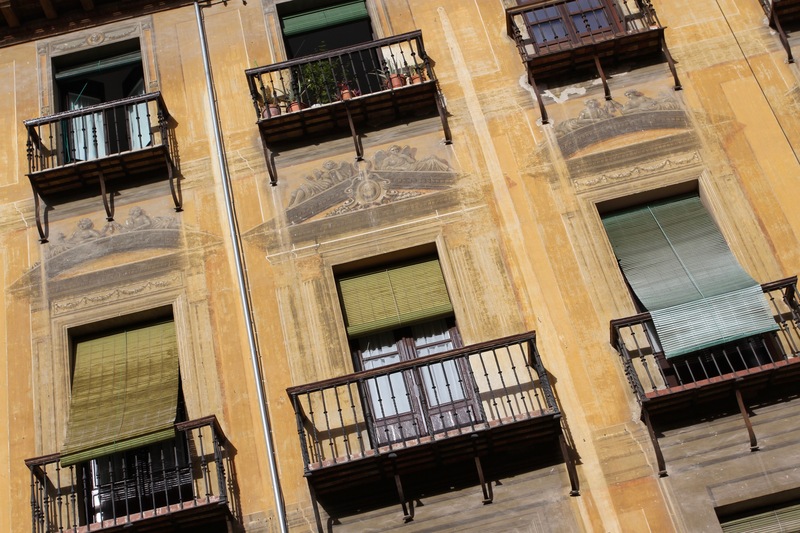 We strolled, made regular visits to historic buildings, ancient churches, atmospheric bars, and took it easy. 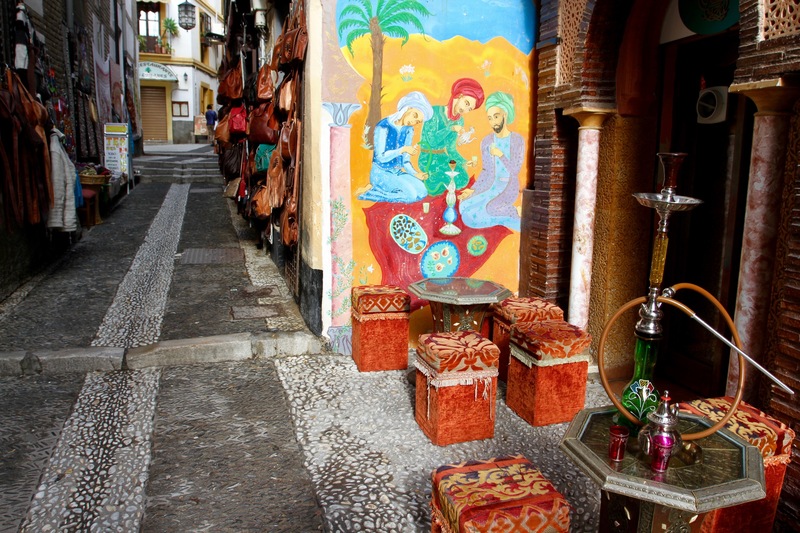 Granada’s an enigmatic place, not without rough edges or petty crime, but that only seems to make it more vibrant.